There's a local antiques shop I visit once in a while, however, it is a rare occasion when I purchase anything from this particular shop because her prices are astronomically high and in my opinion, are more than the item's actually worth or would realize at auction. 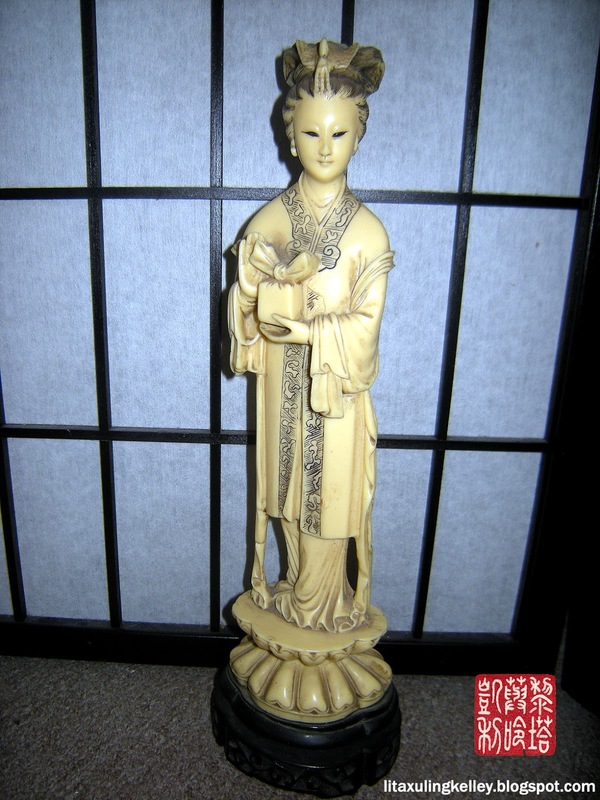 Over the past year, each time I visited, I pondered over whether or not to purchase this faux ivory celluloid statue, or perhaps figurine would be a better word since it's only 13 3/4" high, and each time I passed on it due to the price. I have a particular affinity for the Buddhist bodhisattva of compassion Guanyin, aka Kwan Yin, and thought perhaps this statue was a Japanese representation of her, so I haggled with her since I was not willing to pay her $50 asking price, yet did want the statue, so offered her $25 for it and she obliged, however, after purchase and doing some research, it appears that the figure is not of Kwan Yin, but an empress, or empress dowager. I thought this celluloid statue could be Kwan Yin because she stands on a lotus, something that's traditionally associated with Buddhist icons, and also that her left hand appears to be in Abhaya mudra, yet, the fact that she bears a wrapped gift has thrown me off since I have never seen, nor ever heard of any representations of Guanyin carrying a wrapped gift, nor is there any similar symbolism in Buddhism that I am aware of, so that concludes that the figure is not of Kwan Yin, but of an empress. Having done a little further research, I believe I have the answer as to why this figure stands on a lotus, and that is because many past empresses have become Buddhist nuns after their tenure as empress. I originally thought the statue was Japanese in origin, but having asked around for assistance in identifying and translating the marks, it appears that it may not be Japanese. One source told me that it's sloppy and a mess, making it difficult to translate, and another via Asian Art Forums, one of those self proclaimed "expert" types with no credibility claims that it's fake Japanese writing, so, as a result, I'm unable to determine its origins. Not that he may not be correct, just the manner in which it was stated, which appeared hostile to me, and the fact that he has no history on the forum other than one similar hostile comment to another user. 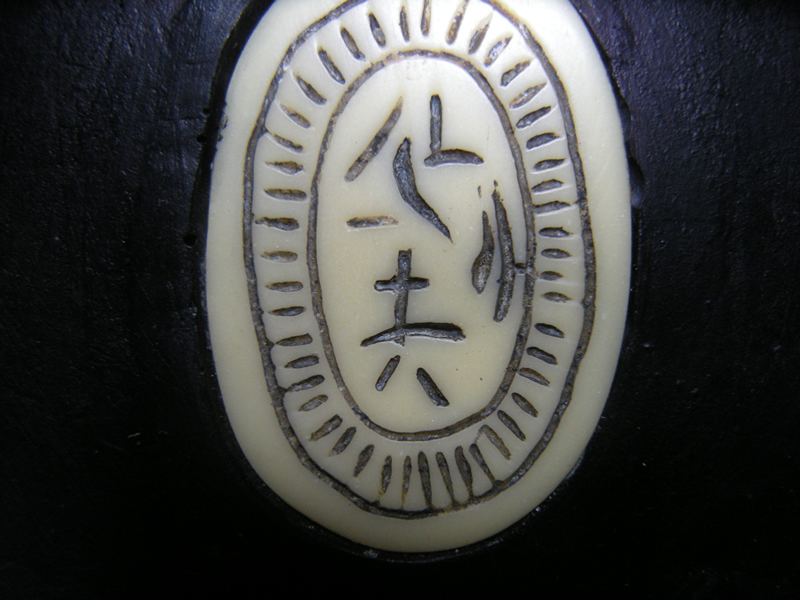 Maybe it's Korean, or perhaps Chinese, or even European made as another user in another post on Asian Art Forums thinks it was made in Italy, although that possibility raises yet another question, if so, why would they put "fake" Japanese writing on it. Perhaps the person carving the mold was illiterate, or perhaps it's the maker's "style", although very unlikely. This celluloid statue leaves me with so many unanswered questions, nevertheless, I do like the piece very much, regardless of its age or origins. The statue is affixed to a painted ceramic base, has a 2 character marking on the back that appears to look similar to でが, translated as dega(s), yet makes no sense whatsoever, and the strokes are way off, so I seriously doubt that's what it is. 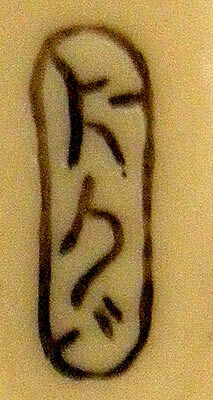 On the bottom is another marking, which nobody has been able to decipher. I believe it's 1920s - 1940s. If anyone reading this has answers for me, please do comment.